Dental implants are changing the way people live. They are designed to provide a foundation for replacement teeth that look, feel and function like natural teeth. The person who has lost teeth regains the ability to eat virtually anything, knowing that teeth appear natural and that facial contours will be preserved. Patients with dental implants can smile with confidence. 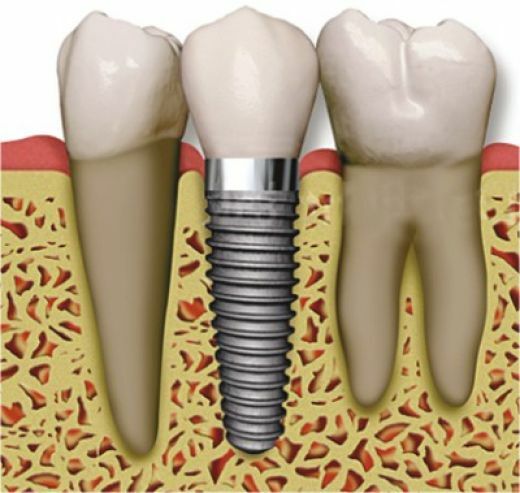 Implants are titanium posts that are surgically placed into the jaw where teeth are missing. These metal anchors act as tooth root substitutes. The bone bonds with the titanium, creating a strong foundation for artificial teeth. Small posts that protrude through the gums are then attached to the implant. These posts provide stable anchor crowns. 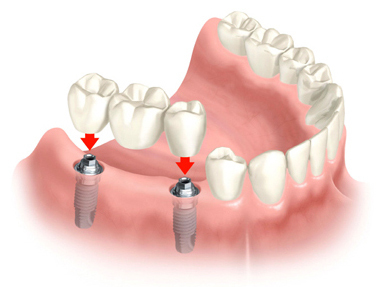 The placement of dental implants involves two surgical procedures. First, implants are placed within your jaw. For the first three to six months following surgery, the implants are beneath the surface of the gums gradually bonding with the jaw. You should be able to wear temporary dentures and eat a soft diet during this time. At the same time, your dentist is forming new replacement teeth. After the implant has bonded to the jaw, the second phase begins. Dr Srinivas will uncover the implants and attach small posts that protrude through the gums and will act as anchors for the artificial teeth. When the artificial teeth are placed, these posts will not be seen. The entire procedure usually takes six to eight months. Most patients experience minimal disruption in their daily life. Using the most recent advances in dental implant technology, Dr Srinivas is able to place single stage implants. These implants do not require a second procedure to uncover them, but do require a minimum of six weeks of healing time before artificial teeth are placed. There are even situations where the implants can be placed at the same time as a tooth extraction further minimizing the number of surgical procedures. Dental Implant placement is a team effort between an oral and maxillofacial surgeon and a prosthodontist. While Dr Srinivas will perform the actual implant surgery, initial tooth extractions, and bone grafting if necessary, our prosthodontist fits and makes the permanent prosthesis. He will also make any temporary prosthesis needed during the implant process. The majority of dental implants and bone graft can be performed in the office under local anesthesia. For anxious patients, we offer the option of nitrous oxide or IV sedation.